#20 N.C. STATE 84, #1 DUKE 67 - Duke was playing without Ryan Kelly and they drew a short straw for their first outing without the talented senior (13.4 pints, 5.4 rebounds). 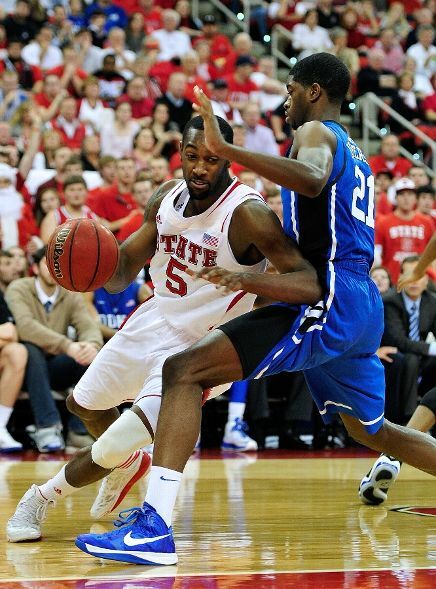 That said, the Wolfpack, the preseason favorite to win the ACC, ended Duke's unbeaten start to the season, toppling the top-ranked Blue Devils at PNC Arena Saturday afternoon. Junior C.J. Leslie, the league's preseason player of the year, scored a game-high 25 points to lead all scorers, but senior Richard Howell's strong work in the paint helped his team overcome Duke's early-game advantage on the boards. Howell finished with 16 points and 18 rebounds, his ninth double-double of the season and the 22nd of his career. Howell had 14 rebounds in the second half alone. NORTH CAROLINA 77, FLORIDA STATE 72 - P.J. Hairston scored a career-high 23 points and North Carolina defeated defending Atlantic Coast Conference champion Florida State 77-72 Saturday, almost a year to day after suffering a 33-point loss against the Seminoles. Hairston made 9 of 14 shots, including four of nine from beyond the arc for North Carolina, which shot 48.3 percent overall and 40 percent from 3-point range. Hairston's final points came on a jumper that boosted the North Carolina lead to 75-72 with 2:10 left. Marcus Paige hit two free throws with 11 seconds remaining to seal the outcome. The Tar Heels (11-5, 1-2) led 33-31 at halftime and took the lead for good at 73-72 with 3:09 when Jackson Simmons, who turned 20 Saturday, scored the go-ahead basket. James Michael McAdoo added 14 points and eight rebounds, and Reggie Bullock had 12 points and eight rebounds as the Tar Heels dominated the boards with a 41-19 margin, including a decisive 19-6 advantage on the offensive boards. WAKE FOREST 75, BOSTON COLLEGE 72 - Sparked by a career-high 29 points from C.J. Harris, Wake Forest staved off a late Boston College comeback attempt to defeat the Eagles on Saturday at Joel Coliseum. After a back-and-forth first half, the Demon Deacons (9-6, 2-1 ACC) built a 12-point lead midway through the final period, but the Eagles (9-7, 1-2 ACC) used an 11-2 run in the final five minutes to draw within a point at 71-70. Wake Forest stood strong defensively though, and Harris made two free throws with 4.5 seconds remaining to seal the victory. Harris' 29 points came on an efficient 10-of-13 shooting and 5-of-6 from the free throw line. He carried the Deacons all afternoon, at one point scoring 11 consecutive points. Travis McKie chipped in 18 points to go with four steals, three assists and one block. Devin Thomas led the Deacons on the boards with 11 rebounds, going over the 10-rebound for the third time in the last four games, to go with six points, three assists, two blocks, steals. VIRGINIA TECH 70, GEORGIA TECH 65 - The Virginia Tech Hokies fought back from an 11-point deficit with 13 minutes to play in regulation and defeated Georgia Tech in McCamish Pavilion on Saturday afternoon. With the win, the Hokies are now 10-6 overall and 1-2 in the ACC and the Yellow Jackets fall to 10-5 overall and are 0-3 in conference action. The Hokies kept the game close throughout and trailed 25-22 at the intermission. Georgia Tech stretched the lead to 43-32 with 13:52 remaining in regulation. Then, the Hokies started getting stops defensively and cut the lead to 53-50 on a three-point field goal from Erick Green with 6:51 remaining in the second half. The Hokies' defense held the Yellow Jackets without a field goal for the last 3:44 of the second half. Cadarian Raines had a bucket with 1:05 remaining and Erick Green tied the game with 24 seconds left in regulation. Georgia Tech got off one last shot, the the attempt missed and Jarell Eddie grabbed the rebound to send the game into overtime. 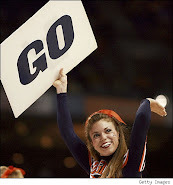 In the extra session, the Hokies scored the first seven points and never trailed in overtime. Eddie and Green iced the game with four free throws in the final 10 seconds of the overtime. 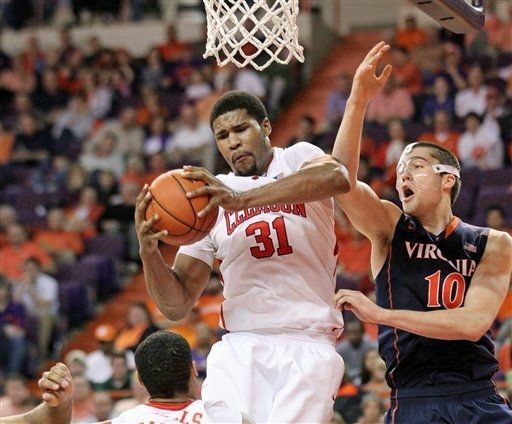 CLEMSON 69, VIRGINIA 44 - Clemson seniors Devin Booker and Milton Jennings led the Tigers to their first ACC victory of the 2012-13 season on Saturday, a 59-44 triumph over Virginia in front of 7,795 fans at Littlejohn Coliseum. The Tigers improved to 9-6 on the season, 1-2 in the ACC. The Cavaliers dropped to 11-5 overall, also 1-2 in league play. It was Clemson's fourth straight win at home over Virginia. Jennings produced a career game for Brad Brownell's team. 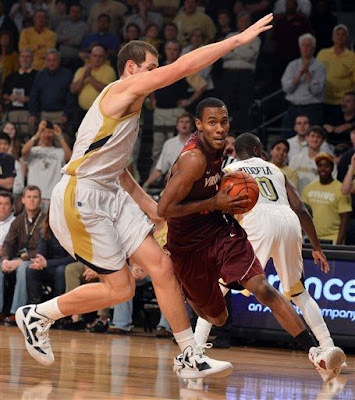 The 6-foot-9 native of Summerville, SC scored a season-best 21 points on 7-of-13 shooting. He made a career high 5-of-8 from three-point distance. It was Jennings' career high against an ACC team. His previous best was 17 in a win over NC State last season. He added a season-high 11 rebounds for his first double-double of the 2012-13 campaign. Booker was just 3-for-10 from the field, but sank 9-of-12 at the charity stripe to finish with 15 points. He added nine rebounds for Clemson, who won the battle of the boards by a +6 margin.